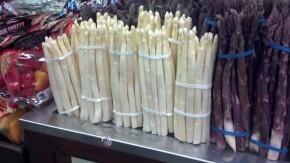 Clean the Asparagus and cut off the tips. Slice the Asparagus with the 8mm (extra thick) Slicing Disc. Cook the sliced Asparagus in the Broth over low heat (after boiling is reached) for 5 minutes. Wipe out the Processor Bowl with a paper towel and insert the STEEL KNIFE (chopping blade); add the Flour and Butter and run just long enough to cut the Butter into the Flour. Add the Cream to the Workbowl and blend together with the Flour mixture. Strain the Asparagus slices from the Broth; measure 1 cup of the Broth and set aside; cook the Asparagus Tips in the remaining Broth for 3 minutes. Puree the Asparagus with the STEEL KNIFE; add the Creamed mixture to the Asparagus Puree along with the reserved Broth. Transfer the Asparagus mixture to a saucepan, and the Salt and Pepper and heat over low heat until serving temperature; for a thinner consistency stir in addition cooking liquid.